It is no secret that the world of publishing is not having an easy time of it. Despite the fact that there are still many excellent books being written all the time, it’s hard to predict exactly what the future of books will be. Electronic books hold a lot of promise but as long as Apple and Amazon are fighting over the profits it doesn’t sound like it’s a great deal for publishers. And although picture books have (so far) been harder to replace with digital versions, sales are declining there as well. So it’s always a joy to come across books that have something extra. 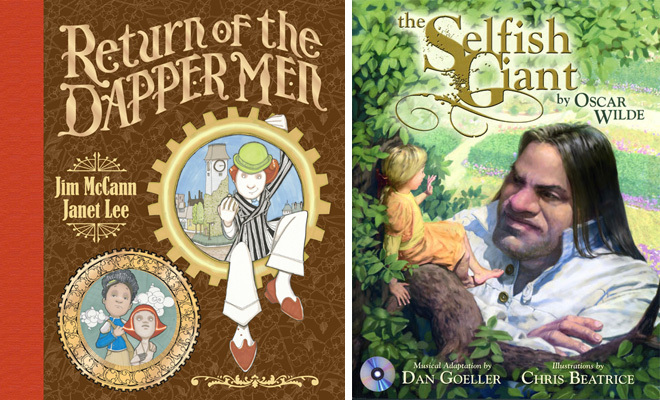 Here are two picture books I’ve received recently that each offer something special for the reader: Return of the Dapper Men by Jim McCann and Janet Lee, and a new adaptation of Oscar Wilde’s The Selfish Giant with art by Chris Beatrice and a musical score by Dan Goeller. ← CABIN FEVER: Funnel Cakes!